This latest edition explains electronic records and security of health information for electronic records, faxes, and email. It also has everything you need to know about MDS 3.0 and recent changes to the survey process. Whether you are a new student or an experienced therapist who works in a nursing home, this book will help you improve your documentation and data security skills. Throughout this book you will find references specific to activity programs in nursing facilities and other situations that fall under OBRA guidelines. Federal regulations with interpretive guidelines and sections of the Resident Assessment Instrument (RAI) Version 3.0 Manual that describe documentation requirements are included. One can't play the game without knowing the rules. Information is the key to meeting residents' needs. Health professionals turn to the clinical record for that information. Whether paper based or computerized, in order for the clinical record to be useful, accurate, and easy to find, documentation must be available for staff to make decisions for resident care. 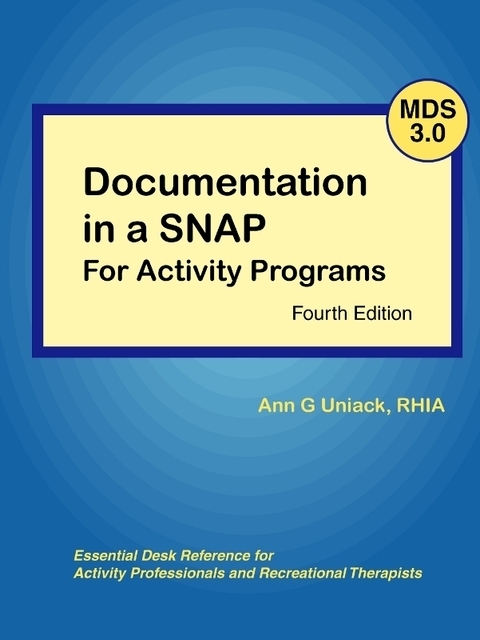 In other words, DOCUMENTATION must be a SNAP! And this book shows you how. Ann G Uniack is a registered health information administrator. Although now retired, she has specialized in clinical record systems for skilled nursing facilities for more than forty-five years. Originally from Portland, Oregon, she received her Bachelor of Science in Medical Records Science from Seattle University. Her professional activities have included election to Director of the California Health Information Association and President of the San Francisco Health Information Association. She has also served as a committee chair and member of various local, state, and national professional association committees. She has been honored by the California Health Information Association as their Distinguished Member in 1997 and received the Professional Achievement Award in 2007. Articles written by Ann G Uniack have been regularly published in the CHIA Journal. She has been a speaker at many seminars on subjects such as documentation in the clinical record and ICD-9-CM coding.